Strategic fit express the degree to which an organization is matching its resources and capabilities with the opportunities in the external environment. The matching takes place through the practice of pre-strategy analysis. That stated, it is very easy to fall into the trap of simplifying the high level concepts and overstating the intricacies and interdependence of strategic-fit factors. Here is a stylised chart that I have used in the past to represent 9 critical factors in ensuring strategic fit. It is referred to as the Cambrian A9 Power Grid – Cambriano is the name of a small European strategy consulting outfit. Seasoned strategy wonks may also perceive similarities between the architecture and plumbing of the model drawn above, and McKinsey’s 7S Framework. Those coincidences are purely… coincidental. What the Cambriano A9 Power Grid strategic-representational-model embodies are key strategic facets that must be clearly visible on the radar of strategic conceptualisation, development, agreement and execution. They are facets that must be taken into consideration when thinking strategically about significant challenges to the organisation and how to address them. A – Approach – how the organisation intends to achieve its vision. The present strategy and the strategy either in the conceptualisation stage or under development or consideration. B – Attitudes – the culture of the organisation and the way the leaders behave towards employees, customers, shareholders, and other participants, at all relevant levels of abstraction. C – Arts – these are the specialist skills and talents that the organisation has access to through the combination of pioneering activities and innovating abilities. E – Axioms – or subordinate goals depending on which version you prefer – the core values and beliefs of the business. F – Assets – capital, real estate, capital goods, intellectual capital, investments, formulas, patents, creative genius, goodwill, market and consumer perception, organizational wisdom, etc. 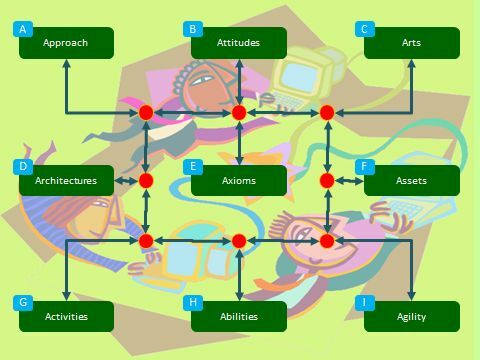 G – Activities – Systems, constructs, processes, decision points and courses – the way activities and processes get the work of the organisation done effectively and efficiently. H – Abilities – the personnel within the organisation and their individual skills, abilities and attitudes. Core competences, extended competences. I – Agility – the dexterity, nimbleness and agility of the organisation, how well it reacts, adjusts and moves, realigns and interacts. For example, the rate at which strategic changes can be effectively executed and measured. When it comes to thinking about strategy, ignoring any of these facets might just introduce additional risk into the process. Therefore, attention must be paid to all of these aspects and a facet should only be relegated or discarded after serious thought. That is not to say that all facets must be analysed to death. The idea is to get to a strategy that addresses a significant organisation challenge, not to spend a lifetime on modelling the square root of zilch. It is just to ensure that if a facet is well understood to the point of being “common sense”, then, an explicit recognition of the facts related to the facet is all that is needed, even if it is just a high-level description it should still be simply, clearly and comprehensively stated.